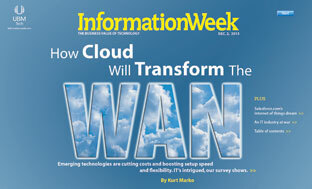 This is the Dec. 2 digital issue of InformationWeek. Access is free, but you must be a registered member of the InformationWeek Business Technology Network to download the issue. Please register below. There's no cost, and it takes only a few minutes. Once done, click the "Go To Digital Issue" button at the bottom of the page. How Cloud Will Transform The WAN: Emerging technologies are cutting costs and boosting setup speed and flexibility. IT's intrigued, our survey shows. Salesforce.com Dreams About The Internet Of Things: CEO Marc Benioff has a vision that needs a dose of reality. An IT Industry At War: The Internet has never been healthier, but we still aren't headed back to 1999 VC returns.